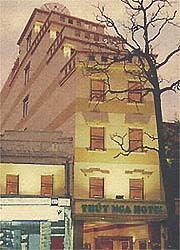 Thuy Nga is an economy hotel located in the heart of Hanoi, with its conveniences and elegant setting. It lies in the magnificent view of Hoan Kiem lake with 24 impressively decorated rooms offer travellers a spacious and comfortable home in Hanoi. There is one restaurant with high standard of cooking and one bar that provides a relaxing haven for cocktail and meeting friends. Elevator, international direct dial telephones, room safety box, laundry services are services indispensable. Standard room: Comfortable standard single/double room with breakfast, fruits and flowers in room, daily English or French newspaper, private bathroom, TV, radio, mini-bar, direct dial telephone, safety box. Superior room: Comfortable superior single/double room with breakfast, fruits and flowers in room, daily English or French newspaper, private bathroom, TV, radio, mini-bar, direct dial telephone, safety box. First class room: Spacious first class single/double room with breakfast, fruits and flowers in room, daily English or French newspaper, private bathroom, TV, radio, mini-bar, direct dial telephone, safety box. Vip room: Spacious single/double/family VIP room with front view, balcony, breakfast, fruits and flowers in room, daily English or French newspaper, private bathroom, TV, radio, mini-bar, direct dial telephone, safety box. All rooms have TV, radio, minibar, air-conditioning, direct dial telephone, modem socket, hairdryer, coffee and tea making facilities. Hotel facilities - Bar, restaurant, room service, private parking, conference rooms, safe, currency exchange, babysitting (baby cot available), laundry service, tour and car service, elevator. Travel from airport - Taxi from airport takes about 40 minutes (US$ 5). Hotel car from airport to hotel US$ 10. Children/extra bed - 1 children below 12 years may share their parents' room free of charge using existing bed. For an extra bed US$ 15 will be charged.